This Webinar is eligible for 1.5 PMI® PDUs in the Leadership category of the Talent Triangle. Are you working in a PMO? Frustrated on how it is executing? Are you running a PMO and just don’t know where to start? 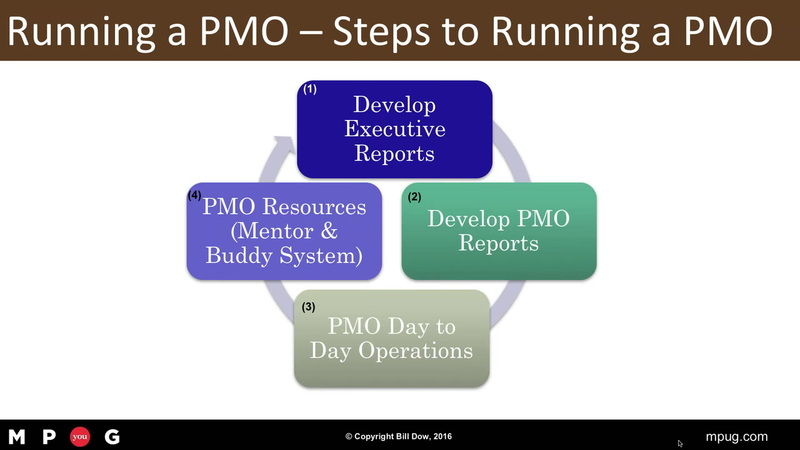 Join Bill Dow as he walks you through the steps in running a successful PMO. This presentation is part 2 of the series how to Build a PMO and carries on from the best practices and techniques we covered in that session. Don’t worry if you missed it, we are going to go from end to end and make sure everyone understand how to build and run the PMO. This was a real good presentation. This is real life stuff also, my PMO manager is actively doing a lot of what bill describes here in the PMO at work. I gain some insight to all the work my PMO manager is doing everyday. I appreciate the feedback and glad you and your PMO Manager at work is finding value.